The official January temperature figures are out. 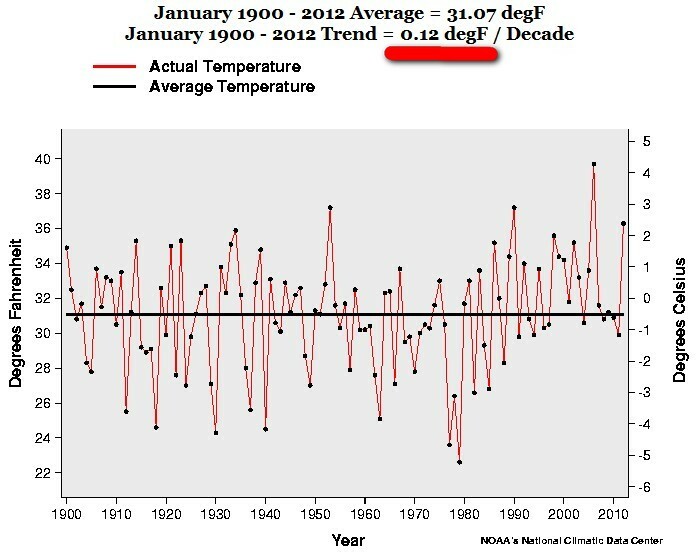 As usual I thought it would be interesting to look at the recent January US temperature from a “historic” perspective. To see how the decade trends have evolved during the last 112 years. So the “warming trend” 2000-2012 for January is exactly – 1.18 F degrees a decade. That is a – 11.8 F COOLER in 100 years. That’s what I call “warming”! 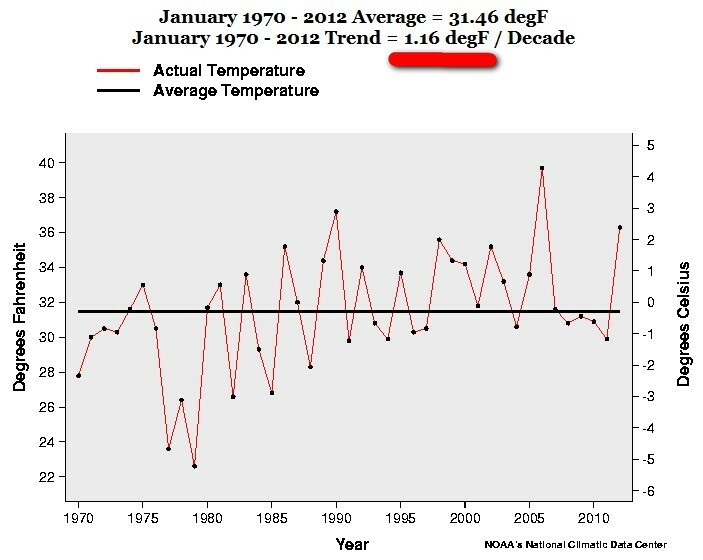 The January trend 1970-2011 is exactly 1.16 F degrees a decade. 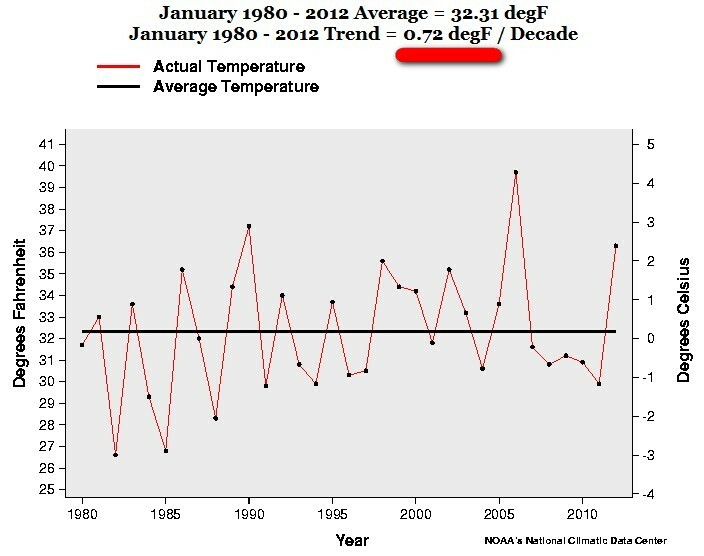 The January trend 1980-2011 is exactly 0.72 F degrees a decade. 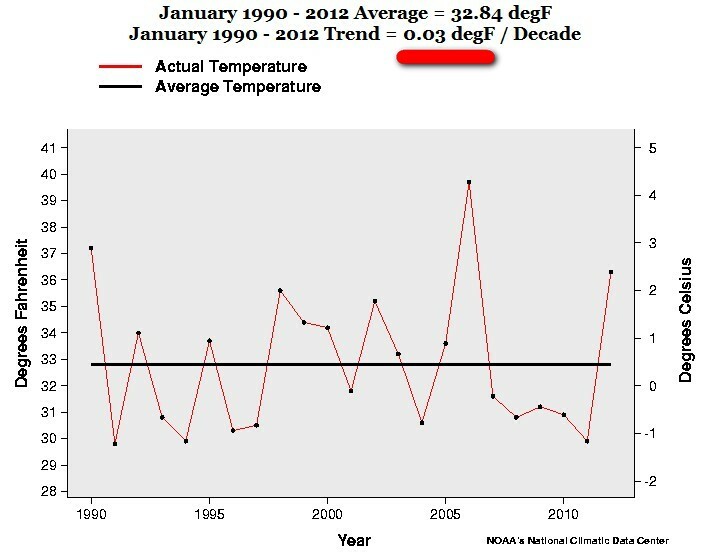 The January trend 1990-2011 is exactly 0.03 F degrees a decade. 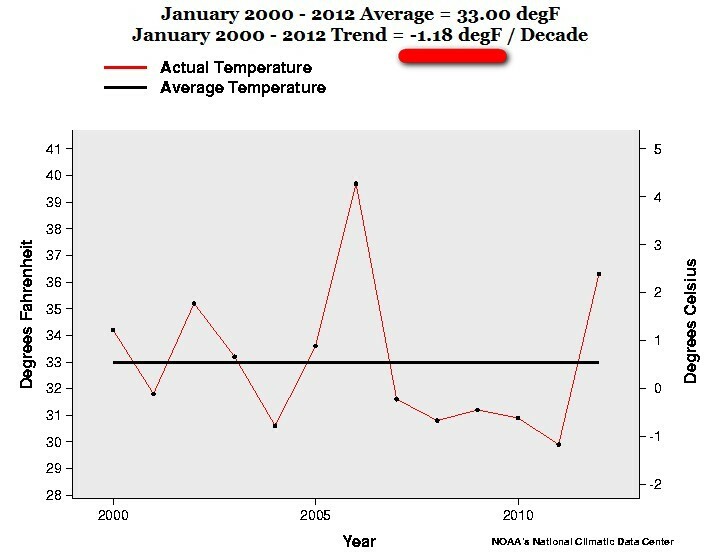 The January trend 2000-2011 is exactly – 1.18 F degrees a decade. This entry was posted on 8 februari, 2012 at 4:22 e m and is filed under Fri- och rättigheter, Miljö - Environment, US Temperature, USA, Yttrandefrihet. You can follow any responses to this entry through the RSS 2.0 feed. You can leave a response, or trackback from your own site. Thank you. Isn’t it very interesting that by their own official data, tweaked and manipulated in so many ways, the cooling continues. But still they continue to force through and preach their religious gospel as if nothing has happened. And force us, the common people, to bear the high costs and consequences of this political agenda. Yes, it is. But it is still a travesty that in order to save western civilization from itself, we have to rely in Nature and in the good old Sun of our ancestors. ”I must warn you that the army of the night has the advantage of overwhelming numbers, and, by its very nature, is immune to reason, so that it is entirely unlikely that you and I can win out. Hi! I’ve been reading your web site for a long time now and finally got the bravery to go ahead and give you a shout out from Lubbock Tx! Just wanted to mention keep up the excellent work!